Jimenez Jr, V. and Monroy, F. P. (2019). Intracellular Invasion and Killing Assay to Investigate the Effects of Binge Alcohol Toxicity in Murine Alveolar Macrophages. Bio-protocol 9(2): e3143. DOI: 10.21769/BioProtoc.3143. Alcohol consumption has diverse and well-documented effects on the human immune system and its ability to defend against infective agents. While pulmonary related infections can occur in healthy humans, binge alcohol use is recognized as a major health risk factor (Nelson et al., 1991). Although binge alcohol consumption has been considered as a risk factor for the development of pulmonary infections, no experimental studies have investigated the outcomes of a single binge alcohol exposure during infection. A key assay to assess the effects of a single binge alcohol exposure on the interactions between bacteria and alveolar macrophage is a binge alcohol intracellular invasion and killing assay. MH-S alveolar macrophages (AMs) are exposed to a single binge alcohol dose prior to infection for 3 h. The macrophage monolayer is then infected to allow for engulfment, followed by removal of extracellular bacteria to assess the intracellular killing capacity of infected macrophages over time. We have utilized this assay to demonstrate that low alcohol exposure significantly suppressed the uptake and killing of less virulent Burkholderia thailandensis (B. thailandensis) by AMs. More recently we found that activated AMs with interferon (IFN)-γ incubated in alcohol (0.08%) for 3 h prior to infection showed significantly lower bacterial uptake at 2 and 8 h post infection, which lead to B. thailandensis survival and a ~2.5-fold replication increase compared to controls (Jimenez et al., 2017). These results provide insights into binge alcohol consumption, a culturally prevalent risk factor, as a predisposing factor for pulmonary bacterial infections. This assay can be adapted to other bacterial species and host cell types to assess tissue specific effects of alcohol during infection. Alcohol is widely accepted as the most popular recreational drug with well-documented adverse effects associated across geographic and social boundaries (Jones and Holmgren, 2009; Pruett et al., 2010). Studies in both human and animal models indicate that acute alcohol or binge alcohol intake, which is characterized by consumption of alcohol reaching a blood alcohol concentration of at least 0.08% within 2-3 h, may be associated with increased health risks over the lifetime of the individual (Wechsler and Nelson, 2008; Moreira et al., 2009). We and others have demonstrated that excessive alcohol consumption is linked to impairment of macrophage function and increased risk for pulmonary infections and sepsis (Bhatty et al., 2011). Alveolar macrophages (AM) are the first line of defense during pulmonary infections, typically located in the distal respiratory tract (Knapp et al., 2003), and are capable of detecting, capturing, and eliminating invading pathogens while being responsible for initiating the early host immune response (Renwick et al., 2001; Qiu et al., 2012). Moreover, alcohol toxicity suppresses bacterial phagocytosis and killing in J774.16 macrophages when infected with Acinetobacter baumannii (Boé et al., 2001; Asplund et al., 2013). Additionally, chronic alcohol increases expression of virulence factors during infections and decreases pulmonary immune defenses in infections caused by Mycobacterium avium, Escherichia coli, Streptococcus pneumoniae, Klebsiella pneumoniae, and Staphylococcus aureus (Bermudez et al., 1993; Gordon et al., 2000; Goral et al., 2008; Camarena et al., 2010). The present assay was designed to investigate the effects of a single binge alcohol exposure on AM engulfment and intracellular killing of less virulent Gram-negative Burkholderia thailandensis. Our results indicate that a single binge alcohol episode can increase opportunistic bacterial infectivity while decreasing host innate immune responses to infection. Understanding the modulating capacity of very low alcohol exposure to alter the initial interaction between host immune mechanisms and pathogens during infection, provides important new insights into how risk factors such as alcohol can increase the infectivity of other non-virulent pathogens in otherwise healthy human hosts. Pre-warm all tissue culture reagents (see Recipes), to 37 °C prior to experiment. This protocol was performed with sterile technique under biosafety level two conditions. Thaw cryovial (1 x 106 cells/1.0 ml), transfer contents of vial to a 15 ml tube and centrifuge for 3 min at 1,300 x g (4 °C). Decant supernatant and resuspend cell pellet in 1 ml of pre-warmed media (see Note above). Transfer cell re-suspension into a T-75 tissue culture treated flask. Incubate the tissue culture flask for 48-72 h in the incubator (see Equipment #6). Replace media in the tissue culture flask every 24 h prior to experiment. Allow AM’s to grow to 70%-80% confluency in the tissue culture flask prior to use in an experimental tissue culture plate. Remove media from the T-75 flask and wash cells with 5 ml 1x DPBS. Trypsinize tissue culture flask by adding 3 ml of trypsin for 4 min at 37 °C. Gently scrape the bottom of the flask to remove attached cells. Agitate flask and observe under an inverted light microscope to ensure that > 90% of the cells have detached. Neutralize trypsin by adding 6-8 ml pre-warmed media. Remove cell suspension from the flask and transfer to a 15 ml conical tube. Spin down cells at 480 x g for 5 min, then remove as much supernatant as possible. Resuspend cells in 3-5 ml of RPMI (pre-warmed to 37 °C). Take 10 μl of the cell resuspension and mix with 10 μl trypan blue. Calculate the concentration of the cell suspension using a hemocytometer as described in Tachibana et al. (2016 and 2017). Ensure no excessive cell doublets are present microscopically. We recommend to re-dissociate excessive cell clumping. Dilute cell suspension to the actual final volume of 5 x 105 cells/ml in RPMI. Aliquot 1 ml RPMI cell suspension per well to a 24-well flat bottom plate. Incubate overnight at 37 °C to enable cells to become adherent. Bring absolute ethanol (200 proof) to room temperature. Replace media and add media supplemented with ethanol reaching a 0.08% v/v concentration in 1 ml (see Recipes). For negative control add media without ethanol. Challenge cells with binge alcohol dose for 3 h.
Wash cells with 1x DPBS and replace media with antibiotic-free media. Note: Incubator water bath is replaced with water supplemented with ethanol reaching a 0.08% (v/v) concentration. Atmosphere ethanol concentration is equivalent to tissue culture media alcohol concentration to minimize evaporation. Prime cells: remove cell supernatant and add fresh RPMI media with 400 U/ml IFN-γ, incubate at 37 °C for 8 to 12 h. Replace media for other wells without 400 U/ml IFN-γ for “no- IFN-γ” control. Note: Alveolar macrophages are stimulated with IFN-γ after alcohol challenge and prior to viable bacterial challenge. No additional exogenous LPS stimulation is required. For each study, utilize frozen stock cultures (Burkholderia spp.) and inoculate LB broth (see Recipes) and incubate overnight at 37 °C in an orbital shaker incubator. Dilute overnight bacterial culture 1:100 (0.1 ml into 9.9 ml LB broth) and allow to grow to late-logarithmic phase measured by optical density (OD) at 600 nm. When OD reaches 0.3 to 0.5 absorbance, collect bacteria in 1 ml by centrifugation (2,500 x g for 5 min) and resuspend in 1 ml of antibiotic-free RPMI media. From preliminary colony forming unit (CFU) plate counts, adjust the volume to provide multiplicity of infection (MOI) of 1:1 CFUs in 20 μl. Determine the MOI (MOI = number of bacteria per alveolar macrophage cell) and alter the inocula preparation accordingly. For an MOI of 1, add 5 x 105 CFU of B. thailandensis per well containing 5 x 105 AM cells. Note: The amount of bacterial culture added will depend upon the density of the bacteria in the media. For this assay, a cell:bacteria ratio of 1:1 is used to allow initial engulfment to occur and further intracellular killing to be monitored. A preliminary experiment should be conducted to determine total CFUs/1 ml for OD used in assay after bacteria are resuspended in antibiotic-free RPMI media. 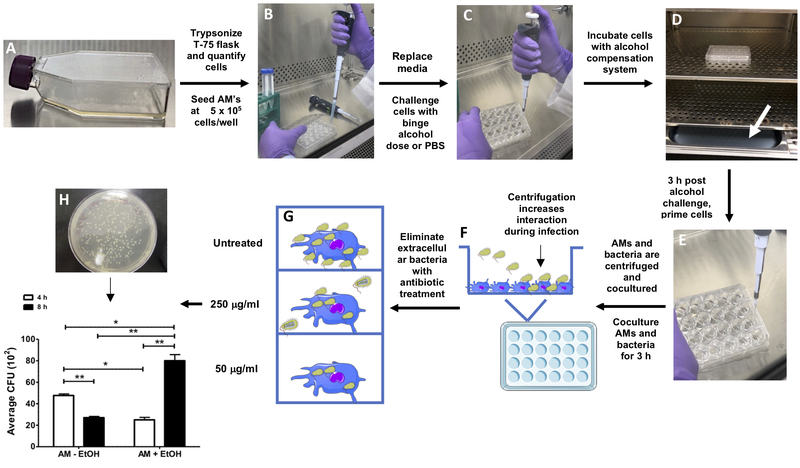 Infect alveolar macrophage monolayers per well by tilting the tissue culture plate toward you while administering the bacteria into pooled media. Do not disturb adhered macrophage monolayer with pipette tip. For negative control add 1x DPBS per well. Centrifuge the cell culture plate for 5 min at 250 x g to increase interaction between cells and bacteria (see Equipment #16). Allow cells and bacteria to co-culture for 3 h.
Note: Media and instruments in contact with viable bacteria were sterilized with 70% ethanol, 10% bleach, and DI water. Discard supernatant from the tissue culture plate into 10% bleach. Wash cell monolayers with pre-warmed 1x DPBS twice. Replace media in the tissue culture plate with RPMI supplemented with 250 μg/ml Kanamycin and incubate monolayers for 1 h.
Note: 250 μg/ml will eliminate ≥ 90% bacteria in 1 h and maintain ≥ 95% viability of macrophage cells. To maintain cell viability, antibiotic concentration is reduced after 1 h.
Remove media and replace with RPMI media supplemented with 50 μg/ml Kanamycin. Incubate cells at 37 °C for a total of 4 and 8 h post infection. Discard media and replace with 0.5 ml of 0.1 % Triton X-100 lysis buffer (see Recipes). Homogenize cell monolayers completely by pipetting up and down several times using a P1000 Pipetman (i.e., at least 50 times) until no clusters of cells are observed. Transfer entire contents of each well into 1.5 ml Eppendorf tubes and label. Spin down cells at 500 x g for 10 min then remove as much solution as possible. Re-suspend cells in 1 ml of pre-warmed LB media. Serial dilute (i.e., 1:10) each sample in sterile 1.5 ml Eppendorf tubes. Apply 50 μl of re-suspended cell lysate onto pre-warmed LB agar plates (see Recipes). Spread contents of cell lysate over the surface of the LB agar plate with a sterile L-shaped spreader (i.e., hockey stick). Allow pre-labeled plates to stand right-side up for 10 min before inverting and storing at 37 °C. Incubate LB agar plates for 48 h.
Note: At 24 h incubation, plates should be removed from the incubator and CFU’s quantified. Some colonies may appear after 24 h. Plates should be validated and further analyzed at 48 h post initial incubation. Figure 1. Representative image at different time points of binge alcohol and phagocytosis protocol. A. Alveolar macrophages (AMs) grown in a T-75 tissue treated flask. B. Quantified AMs are seeded into a 24-well plate tissue culture at a density of 5 x 105 cells/well. C. AMs are challenged with a single binge alcohol dose (0.08% v/v). D. Cells are incubated in a low evaporative tissue culture plate and the binge alcohol compensation system is applied (white arrow). E. AMs are primed with IFN-γ post alcohol challenge. F. AMs are infected and tissue culture plate is centrifuged to increase AM-bacteria interaction for engulfment and intracellular invasion. G. AMs are treated with 250 μg/ml for 1 h, followed by 50 μg/ml kanamycin to eliminate extracellular bacteria. H. After 4 and 8 h post infection, AMs are washed, lysed, serial diluted, and viable bacteria grown on LB agar plates. CFUs are quantified and averaged per experimental group compared to control (non-alcohol treated cell). For data analysis, to assess the colony forming unit (CFU) we use a minimum of three experimental replicates. For each experimental replicate, we analyzed 3 assay replicates per dilution (i.e., 3 LB agar plates for 101, 102, 103 dilutions). We take images of each LB agar plate, count bacterial colonies on each respective LB agar plate and analyze colony formation at 24- and 48-h post CFU plate formation (Jimenez et al., 2017). For statistical analysis, we use GraphPad Prism. To compare two data sets, we perform a Student’s t-test. When centrifuging the bacterial sub-culture, we recommend an optical density (OD) near 0.5 as you may lose bacteria during resuspension in RPMI antibiotic-free media. We recommend making all reagents fresh prior to use. The protocol can be adapted to test the effects of binge alcohol toxicity on AMs with different bacterial (wild-type) infections. Note: Preliminary studies should be conducted to determine bacterial growth conditions and antibiotic sensitivities prior to AM infection. Note: Make fresh prior to use. Note: Media is made in 50 ml stocks. Note: Basal media arrives supplemented with L-glutamine from purchase provider. Note: Make fresh and allow to reach room temperature prior to use. Note: Dissolve powder completely before dilutions. This protocol is an extended version of the one described in Jimenez et al. (2017). The research has received funding from The Department of Defense (DTRA) [HDTRA1-14-C-0022]. We thank research associates at The Pathogen Microbiome Institute (PMI) at Northern Arizona University for helpful suggestions in optimizing this assay and to Dr. Paul Keim for the generously providing B. thailandensis. In addition, we thank Dr. Becky Coleman, for guidance and direction with the initial approach. Asplund, M. B., Coelho, C., Cordero, R. J. and Martinez, L. R. (2013). Alcohol impairs J774.16 macrophage-like cell antimicrobial functions in Acinetobacter baumannii infection. Virulence 4(6): 467-472. Bermudez, L. E., Young, L. S., Martinelli, J. and Petrofsky, M. (1993). Exposure to ethanol up-regulates the expression of Mycobacterium avium complex proteins associated with bacterial virulence. J Infect Dis 168(4): 961-968. Bhatty, M., Jan, B. L., Tan, W., Pruett, S. B. and Nanduri, B. (2011). Role of acute ethanol exposure and TLR4 in early events of sepsis in a mouse model. Alcohol 45(8): 795-803. Boé, D. M., Nelson, S., Zhang, P. and Bagby, G. J. (2001). Acute ethanol intoxication suppresses lung chemokine production following infection with Streptococcus pneumoniae. J Infect Dis 184(9): 1134-1142. Camarena, L., Bruno, V., Euskirchen, G., Poggio, S. and Snyder, M. (2010). Molecular mechanisms of ethanol-induced pathogenesis revealed by RNA-sequencing. PLoS Pathog 6(4): e1000834. Goral, J., Karavitis, J. and Kovacs, E. J. (2008). Exposure-dependent effects of ethanol on the innate immune system. Alcohol 42(4): 237-247. Gordon, S. B., Irving, G. R., Lawson, R. A., Lee, M. E. and Read, R. C. (2000). Intracellular trafficking and killing of Streptococcus pneumoniae by human alveolar macrophages are influenced by opsonins. Infect Immun 68(4): 2286-2293. Jimenez, V., Jr., Moreno, R., Kaufman, E., Hornstra, H., Settles, E., Currie, B. J., Keim, P. and Monroy, F. P. (2017). Effects of binge alcohol exposure on Burkholderia thailandensis-alveolar macrophage interaction. Alcohol 64: 55-63. Jones, A. W. and Holmgren, A. (2009). Age and gender differences in blood-alcohol concentration in apprehended drivers in relation to the amounts of alcohol consumed. Forensic Sci Int 188(1-3): 40-45. Knapp, S., Leemans, J. C., Florquin, S., Branger, J., Maris, N. A., Pater, J., van Rooijen, N. and van der Poll, T. (2003). Alveolar macrophages have a protective antiinflammatory role during murine pneumococcal pneumonia. Am J Respir Crit Care Med 167(2): 171-179. Moreira, M. T., Smith, L. A. and Foxcroft, D. (2009). Social norms interventions to reduce alcohol misuse in university or college students. Cochrane Database Syst Rev(3): CD006748. Nelson, S., Bagby, G., Andresen, J., Nakamura, C., Shellito, J. and Summer, W. (1991). The effects of ethanol, tumor necrosis factor, and granulocyte colony-stimulating factor on lung antibacterial defenses. Adv Exp Med Biol 288: 245-253. Pruett, S. B., Fan, R., Cheng, B., Glover, M., Tan, W. and Deng, X. (2010). Innate immunity and inflammation in sepsis: mechanisms of suppressed host resistance in mice treated with ethanol in a binge-drinking model. Toxicol Sci 117(2): 314-324. Qiu, H., KuoLee, R., Harris, G., Van Rooijen, N., Patel, G. B. and Chen, W. (2012). Role of macrophages in early host resistance to respiratory Acinetobacter baumannii infection. PLoS One 7(6): e40019. Renwick, L. C., Donaldson, K. and Clouter, A. (2001). Impairment of alveolar macrophage phagocytosis by ultrafine particles. Toxicol Appl Pharmacol 172(2): 119-127. Tachibana, N., Cantrup, R., Dixit, R., Touahri, Y., Kaushik, G., Zinyk, D., Daftarian, N., Biernaskie, J., McFarlane, S. and Schuurmans, C. (2016). Pten regulates retinal amacrine cell number by modulating Akt, Tgfβ, and Erk signaling. J Neurosci 36(36): 9454-9471. Tachibana, N., Zinyk, D., Ringuette, R., Wallace, V. and Schuurmans, C. (2017). Heterochronic pellet assay to test cell-cell communication in the mouse retina. Bio-protocol 7(3): e2117. Wechsler, H. and Nelson, T. F. (2008). What we have learned from the Harvard School of Public Health College Alcohol Study: focusing attention on college student alcohol consumption and the environmental conditions that promote it. J Stud Alcohol Drugs 69(4): 481-490. How to cite: Jimenez Jr, V. and Monroy, F. P. (2019). Intracellular Invasion and Killing Assay to Investigate the Effects of Binge Alcohol Toxicity in Murine Alveolar Macrophages. Bio-protocol 9(2): e3143. DOI: 10.21769/BioProtoc.3143.